An effective Dead Sea Mud combined with natural Anti-Cellulite Extracts (Guarana, Horsetail&Caffeine) designed to improve the appearance of the skin while reducing orange skin and cellulite. Very gentle stimulation that enhances cellulite reduction, better blood circulation and skin toning. Makes your body firm with healthy shape. Direction of use: Shake well before use. Gently smooth Mud over clean body in an even layer. Keep to dry naturally for 25-30min. For maximum results, you can wrap body if possible. Remove the mud using circular motion in order to enhance blood circulation and warm up the area. Rinse off your body thoroughly with warm water using Rivage Shower Gel. 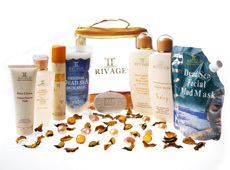 Follow with Rivage Firming Cellulite or Rivage Anti-cellulite Cream. Use on clean skin twice a week.